Remaly Manufacturing has been in business since 1865 and is a leading provider of both custom metal fabricating and perforated metal services. We are committed to staying on the cutting edge in terms of technology and we have recently upgraded our manufacturing capabilities to include top of the line CNC Press Brake capabilities. On top of this freshly added service we also have a number of other services that will cover virtually all your metal needs. Some areas where we excel include perforating, welding, bending, forming, and rolling; do not hesitate to call one of our sales representatives to see how we can help you with your next project. A press brake, also known as a brake press, is used for bending sheet metal and other materials into a desired shape. The specifications of a press brake are typically broken down into two main categories, force of the machine and the working length. The process involves placing the piece of sheet metal between two parts of the machine that are referred to as the punch and die. The die is in the shape of the desired end product and the punch forces the metal down into the die. The process bends the metal at the precise angle desired by using the right amount of force and correct punch and die combination. Our machine is a recently purchase 3100 CNC Press Brake from TRUMPF and it has a press force of 1000 kN (kilonewtons) and a bending length of 3060 mm (millimeters). Thanks to the advantages of this machine we are able to take on just about any press brake forming request. Its fast tool change feature and automatic tool clamping system make custom bending even easier, resulting in faster turnaround times for our customers. 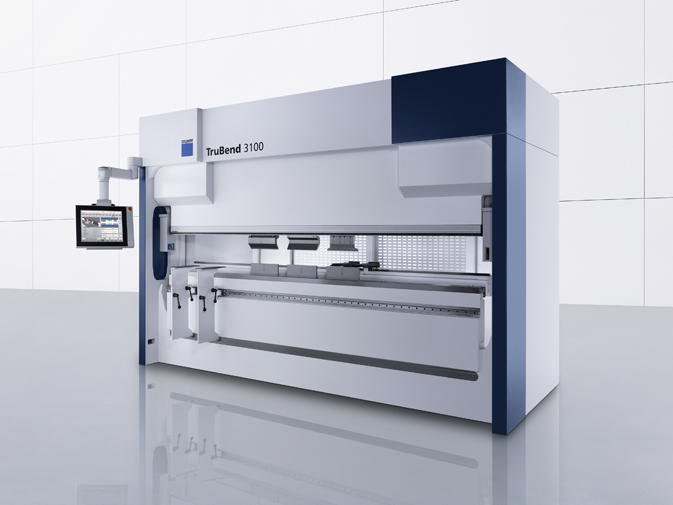 In fact, the 3100 CNC Press Brake has the highest axis-speed in its class. We are devoted to serving our customer’s needs, and this machine is the perfect fit for that commitment. Our service will allow us to test and develop application-specific solutions easily, that way we can try out different things to make sure that the product you end up with is a product that will fit your application and leave you satisfied. The quality of our press brake forming is at the top of the industry thanks to the high axis accuracy of the 3100 CNC Press Brake and the automatic crowning facility allows for constant bending angles over the entire bending length. Remaly Manufacturing Company is dedicated to providing top of the line services and we have been for over 150 years. We are always working and striving to grow our business which is why we are constantly adding new custom services to our experience. Here at Remaly we know that our turnaround times are what separates us from our competition. This is why we are proud to say that our press brake forming will be no different, because we know that our customers expect our orders to ship, and ship accurately, within one week.